‘Sacred Centre of the Universe’. Samoa (formerly Western Samoa) is an archipelago of nine islands at the centre of the south-west Pacific island groups, surrounded by (clockwise from north) Tokelau, American Samoa, Tonga, and Wallis and Futuna. 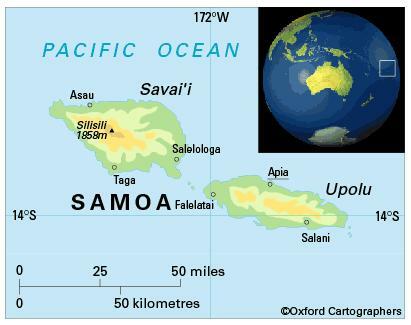 The nine islands of Samoa are Apolima, Manono, Fanuatapu, Namu’a, Nuutele, Nuulua, Nuusafee, Savai’i (the largest, at 1,708 sq km including adjacent small islands) and Upolu (second largest, at 1,118 sq km including adjacent small islands). Five of the islands are uninhabited. Tropical maritime. The weather is hot and rainy from December to April and cooler, with trade winds, from May to November. Samoa is prone to hurricanes and cyclones which sometimes cause devastation. Cyclone Val in December 1991 – the worst storm to hit the islands in more than 100 years – destroyed over half the coconut palms. The country was again devastated in 1998. 189,000 (2012); 20 per cent of people live in urban areas. The population growth rate stood at 0.7 per cent p.a. between the years of 1990 and 2012, depressed over this period by emigration, mostly to New Zealand. In 2012 the birth rate was 27 per 1,000 people (39 in 1970) and life expectancy was 73 years (55 in 1970). The population is predominantly Polynesian, with small minorities of Chinese, European, or other Pacific descent. The people live mainly in extended family groups, known as aiga. These groups are headed by a leader, known as matai, who is elected for life. The population is largely concentrated in villages close to the shore. There are 131,103 Samoans living in New Zealand, more than half of whom were born there (2006 New Zealand census). Samoa is classified as a lower-middle-income economy by the World Bank.